The Monarchs have arrived and now it is important to have early blooming composite native wildflowers available to supply the adult butterfly with nectar and Milkweed available for them to lay their eggs upon. Eventually, the eggs will hatch into tiny caterpillars and they will begin their great feast and grow into big, plump caterpillars. 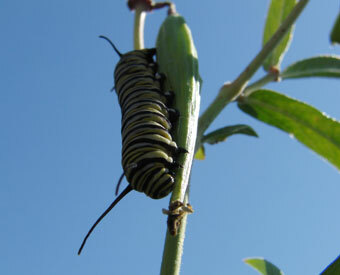 See our “Home Page” to link to Wildflowers that will provide nourishment and habitat for all stages of the lifer cycle of the Monarch Butterfly! Celebrating 20 years specializing in growing Native Plants!